Giant Chain FernSemi-evergreen fern. Can go dormant if not protected. Fast growing. 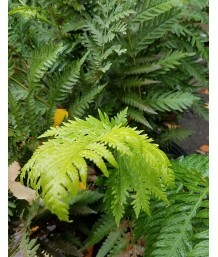 Vase-shaped form..
Chinese Chain FernSemi-evergreen fern. Can go dormant if not protected. Vase-shaped form. Bold, arch..